“The best perk of the White House is not Air Force One or Camp David or anything else, it’s the wonderful movie theater I get here,” President Bill Clinton told Roger Ebert in 1999. According to newly released documents obtained by Gizmodo through a Freedom of Information Act request, President Clinton did indeed love watching movies at the White House. He blew through 171 films while he was in office, not including duplicates (Clinton watched The Patriot, Braveheart, and Music of the Heart twice). But there are some curious gaps in the record. Based on the heavily-redacted documents provided by the Clinton Presidential Library and the National Archives, I’ve compiled a list of all the movies Clinton watched from 1993 until 2001. The most curious part may be that, according to the documents, the president watched just three movies in 1996, and only seven in 1997. This seems... unlikely. 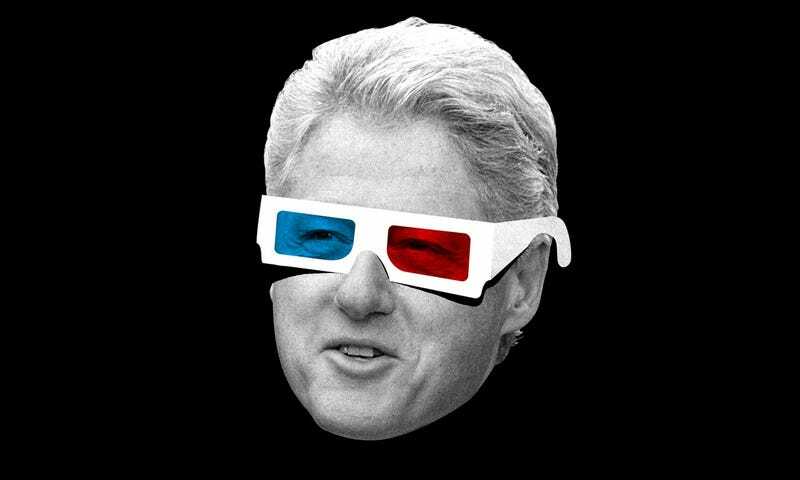 One of the first questions people have about Clinton’s movie-viewing habits is whether he ever watched a movie with Monica Lewinsky. The short answer is that we don’t know. Most attendee names are redacted, but given that Lewinsky’s nine sexual encounters with President Clinton spanned from November of 1995 to March of 1997 (a period of time for which there are very few movies listed) there will no doubt be further speculation. A few days after the Lewinsky scandal broke in the mainstream press on January 21, 1998, the Clintons hosted a screening of the Robert Duvall movie The Apostle. Attendees were said to be keeping a close eye on Bill and Hillary’s interactions. Keeping a close eye on Bill and Hillary’s interactions. According to the list, Clinton watched new movies almost exclusively. As someone who has become obsessed with the viewing habits of US presidents, I can say that this is a big departure from the Nixon, Carter, and Reagan administrations—presidents who watched new releases, but also plenty of classics. And despite Clinton’s claims to have seen the movie High Noon roughly 20 to 30 times, the classic Western doesn’t appear once in the list provided by the Clinton Library. Clinton has also repeatedly claimed that another of his favorite movies is Casablanca. Again, that movie doesn’t show up in the documents provided to Gizmodo. What does show up? Mostly mainstream movies of the 1990s, like Forrest Gump, Enemy of the State, Jerry Maguire, Saving Private Ryan, The Patriot, Apollo 13, You’ve Got Mail, Philadelphia, and Mrs. Doubtfire. There are a few interesting films that might be considered cult classics, such as The Big Lebowski and Fight Club. For what it’s worth, Clinton told Roger Ebert that Fight Club was good but a bit too nihilistic for his tastes. Clinton also watched Star Wars: Episode I, though I have yet to confirm what he thought of Jar-Jar. There are a few possible explanations to account for the absence of classic films. Clinton may have exaggerated his taste for older movies in interviews. But it might also have to do with the evolving role of the White House theater. Since 1915, when President Woodrow Wilson screened the first film at the White House, movies have been a way to connect with foreign leaders, filmmakers, and members of the press. But schmoozing over a movie seems to have intensified in the 1990s. Journalist Maureen Dowd, for example, watched Field of Dreams at the White House with the first President Bush. And Jimmy Carter watched the first Star Wars movie in a secret meeting with Egyptian President Anwar Sadat in the lead up to the Camp David Peace Accords. Reagan even hosted director Stephen Spielberg, who brought a print of E.T. for a special screening at the White House that included Supreme Court Justice Sandra Day O’Connor and Neil Armstrong. But Clinton’s choice of new movies probably speaks to his use of the theater for entertaining outside visitors more than a reflection of his personal taste. Clinton often showed up as himself in the movies he watched. Films like The Siege and Crimson Tide, both on the list, utilize clips of the real Clinton. The president was reportedly angry about one scene in the 1997 alien drama Contact, but that movie isn’t on the list—yet more evidence that the documents we were given may be incomplete. Another movie missing from 1997 that Clinton told Ebert he adored? L.A. Confidential. Sure, part of the fun of examining Presidential movie-watching habits is simple voyeurism. But if we accept that media influences the way we see the world, then there are also very real public and foreign policy implications to these lists. The 1998 movie The Siege is fascinating to watch with the benefit of hindsight. The movie depicts cells of Middle Eastern terrorists setting off bombs in New York. The CIA is implicated in training some of the terrorists and the FBI is frustrated with the lack of communication between the agencies. There’s also fierce debate when martial law is declared and all New Yorkers of Middle Eastern descent are rounded up in camps. The film shows real clips of Clinton talking about a real terrorist attack that predates 1998, but he may as well have been talking about the attacks that would occur just three years later on September 11, 2001. Practically all modern presidents watched dramatizations of war, government conspiracies, and the political process more generally. President Nixon watched The Chairman, On the Beach, and Executive Action, a 1973 movie about a conspiracy to kill President Kennedy. The first movie President Carter watched in office was All the President’s Men, and he watched films like The President’s Lady about Andrew Jackson. And when President Reagan wasn’t watching his own movies (yes, he watched Bedtime for Bonzo while in office) he found time for feel-good Cold War comedies like Robin Williams’ Moscow on the Hudson. But Clinton seemed to watch more movies featuring presidents (both fictional and real) than your average US leader—with the exception of Lyndon B. Johnson, whose favorite movie was a propaganda film of himself that he would watch on repeat. From Dave, a movie about an imposter president, to Independence Day, a movie about an alien species defeated single-handedly by an inspiring presidential speech, Clinton watched them all. He even watched Deep Impact, a movie about an Earth-cleansing asteroid that makes President Morgan Freeman sad. Clinton’s movie tally pales in comparison to Jimmy Carter’s total of well over 400 movies. And Carter only served for four years, as opposed to Clinton’s eight. But I can’t stress enough that this list is probably incomplete, even if it’s the most comprehensive account we have to date. Top image by Jim Cooke, photo via AP. Correction: This post originally missed the fact that Clinton watched Braveheart twice. Gizmodo regrets the error and apologizes profusely to the star of the 2011 classic, The Beaver.